Jidenna, Daveed Diggs, Darryl “DMC” McDaniels, Michael B. Jordan, and the Roots perform during the All-Star Game as part of the 2017 NBA All-Star Weekend on Feb. 19, 2017 at the Smoothie King Center in New Orleans, Louisiana. 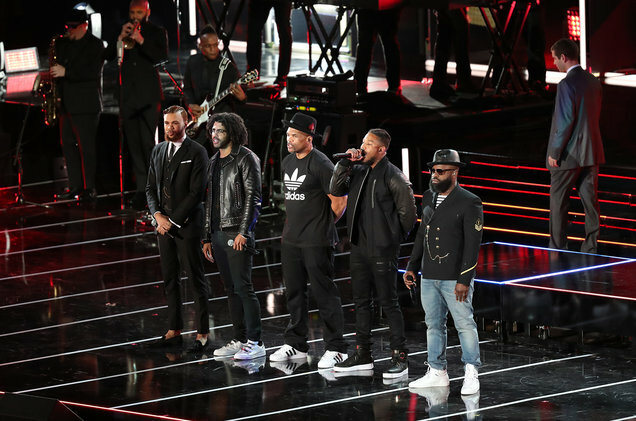 ‘Hamilton’ actor Daveed Diggs, DJ Jazzy Jeff, actor Michael B. Jordan, Jidenna and Run D.M.C.’s Darryl McDaniels all played a part. The Roots kicked off the NBA All-Star Game in New Orleans on Sunday (Feb. 19) with a star-studded basketball musical called The Evolution of Greatness. With the help of Hamilton actor Daveed Diggs, DJ Jazzy Jeff, actor Michael B. Jordan, Jidenna, Run D.M.C.’s Darryl McDaniels and others, the Roots took over the Smoothie King Center to examine the history of the game. “We live in a culture that has always been obsessed with one age-old question: who’s the best?” the Roots’ Black Thought said opening the number — which the band created — setting up an era-by-era look at basketball’s greatest players and the sport’s development over time. The Roots perform during H.O.M.E. in DC with Martell Cognac at Union Market on Nov. 5, 2016 in Washington, DC. McDaniels spoke with Billboard about the performance, highlighting its educational value for a younger generation who may not know about the NBA’s rich history.